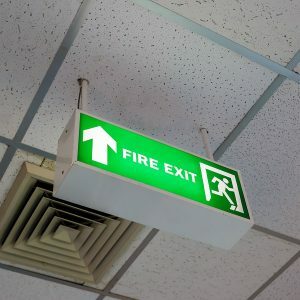 Having properly working fire alarms is crucial. Conventional fire alarm systems have been around since electronics became commonplace. Presently, these systems are rarely used in large buildings but are not uncommon in small schools, stores, restaurants, and apartments. A conventional Fire Alarm Control Panel employs one or more circuits, connected to smoke detectors and manual pull stations (initiating devices) wired in parallel. To facilitate location and control of a fire within a building, the structure is subdivided into definite areas or zones. Floors of a multistory building are one type of zone boundary, for example. The state of each smoke detector or manual pull station within a zone displays at the control panel using visible indications called annunciators. During the 1970’s and 80’s, this was considered the state of the art even though the information transmitted was rudimentary compared to what is available today. Due to the demand for larger systems and more precise diagnostic and location detail addressable fire alarm panels were introduced during the 1980’s. Addressable panels are infinitely more advanced than their conventional counterparts, with greater information capacity and control flexibility. How is the process of upgrading the system completed? The first item is to perform a field survey to investigate the existing system configuration. Most important is the number and location of smoke detector circuits. The wiring configuration and compatibility with replacement detectors are factors to consider. It’s possible that the existing wiring can be connected to support new addressable detectors. Another factor is the number and circuit arrangement of the existing notification appliances (horns and horn/strobe lights). Their age and supporting power requirements are critical factors as to whether they can be reused. Once a strategy has been crafted a meeting should be scheduled with the fire marshal to review the plan. Depending on the outcome a written agreement between the client and fire marshal may be in order to outline the process and design. A conversion could involve simply replacing the fire alarm control panel with appropriate circuit upgrades. It may also include replacing the initiating and notification appliances as well as other code compliance upgrades. The following construction phases are typical for conventional system conversions. Phase II- Replacement of the existing fire alarm control panel. Pretesting of the new system to occur immediately after replacement to ensure the client has a functional system until the acceptance test. Phase III – If new addressable devices are required, replace existing devices accordingly reusing existing circuitry where possible. Phase IV- If new notification appliances are required, replace existing appliances accordingly reusing existing circuitry where possible. Phase V – Pretesting and final acceptance testing with the fire marshal. Get The Best of the Best from Fireline! At Fireline, we offer an array of portable fire extinguishers, fire alarms, and sprinkler systems to keep your property safe. Fireline offers the highest quality alarm systems to alert occupants in your business of fires and carbon monoxide poisoning. We also offer fire suppression systems and fire sprinkler systems to keep fires controlled should an incident occur. Our trained sales staff will work with you to determine which system is best for your business and our technicians will ensure a quality installation. Fireline service technicians can test, inspect and repair any existing systems you may have. To get started with Fireline today, or for more information on fire alarm, sprinkler, or suppression systems call us at 1-800-553-3405, or visit our contact page. This entry was posted on Wednesday, May 24th, 2017 at 2:08 pm. Both comments and pings are currently closed.